Even though Brent Waller‘s LEGO Ghostbusters Ecto-1 set was recently approved as the latest official CUUSOO set, you might be among those disappointed that the beautifully rendered Firehouse in Brent’s original CUUSOO project wasn’t also approved. But fear not! 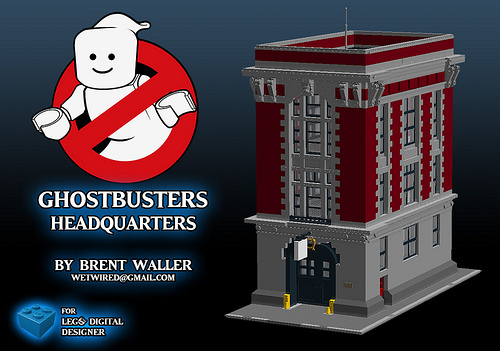 Brent has just released the step-by-step instructions for the Ghostbusters HQ in LEGO Digital Designer (LDD) format. You can download Brent’s instructions from his Eurobricks post. why wasn’t it approved? would it become too expensive for all those pieces? or are they waiting to see if the Ecto 1 is a success to parlay it into a line of releases? Gordon, from what I read there were two considerations for why no station. The first was of course price (since cheaper sets are more marketable). The second was development time—doing just the car helped them to bring the set from concept to finished model in time to be released midway through the anniversary year! What’s the most economical way of getting the bricks to build this? It seems Pick a Brick would cost a small fortune.